This is to inform all foreign Passport holders that if they wish to attend Satsang Programme in India then they should do so only for the Mumbai programme - & should not plan / request to visit the Ashram / 16PS RaisinghNagar , Sriganganagar , Rajasthan, since the Ashram falls in the Protected / restricted area category marked by the Govt. of India . Ajaib Singh Ji Maharaj - the Perfect Master(1926-1997), known to His disciples as Sant Ji, was born September 11, 1926 in Maina, District Bhatinda, Punjab, India. Sant Ajaib Singh was a Sant of Surat Shabda Yoga. His Master was Sant Kirpal Singh Ji Maharaj of Delhi, is said to have come from a lineage of masters descending from Kabir. Ajaib Singh gave initiation into the Light and Sound Principles. 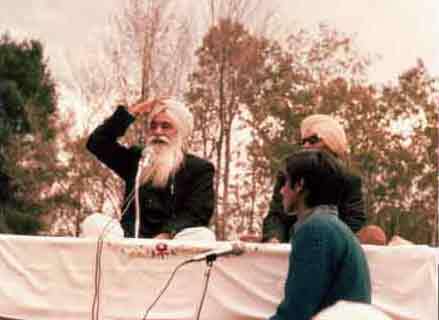 He left the body on His own will on July 6, 1997.
www.ajaibbani.org is the official website created by Sant Bani Ashram 16 PS Rajasthan India concerning the information about various Satsang and Meditation programmes & events organized by Satsangi's of Sant Ajaib Singh ji. Sant Ajaib Singh ji's Love for His Guru Sant Kirpal Singh & Maharaj Sawan Singh is reflected in His songs ( Bhajans) & satsang discourses which is being compiled in this website for the benefit of His sangat far & wide. Any body willing to contribute any related information is welcome to do so. Every year starting from July to April monthly Satsang programmes are organized as was being done during Sant ji's physical presence amongst us. It is our desire to maintain and continue in the same path and tradition as far as possible or until we are guided by the Sant ji's next form. The monthly Satsang programme at Sant Bani Ashram 16 PS Rajasthan is held on the last Sunday of the month with the exception of Sant Ajaib Singh ji's birthday , Maharaj Kirpal Singh ji's birthday and Maharaj Sawan Singh ji's Anniversary celebrations which are held on 11th Sep, 6th Feb. and 2nd April respectively. In addition to the above, a 3-Day Satsang and Meditation programme is held in New Delhi during the month of May, and a similar 5-Day programme in Mumbai during January and a 3-Day programme in Ahmedabad in July every year. Anybody desirous of taking advantage from the above mentioned programmes is welcome to do so.